An x-ray examination of an artery where a catheter (a small tube) is placed into the artery and a dye is injected into the vessel to show contrast. The contrast makes the artery visible on the x-rays, and can reveal a blockage of an artery, how severe it is and what is causing it. Common causes include a blood clot or atherosclerosis (hardening of the arteries). Computed tomography or CT, shows organs of interest at selected levels of the body. They are the visual equivalent of bloodless slices of anatomy, with each scan being a single slice. CT examinations produce detailed organ studies by stacking individual image slices. CT can image the internal portion of organs and separate overlapping structures precisely. The scans are produced by having the source of the X-ray beam encircle or rotate around the patient. X-rays passing through the body are detected by an array of sensors. Information from the sensors is computer processed and then displayed as an image on a video screen. Low dose CT scans for lung cancer screening are also available. Summerlin Hospital offers one of the most accurate tests available for detecting osteoporosis, the DEXA bone density scan. The DEXA bone density scan measures the strength of your bones by testing how dense they are. By doing this, bone density tests can show if you have osteoporosis or may get it. They can also detect if you are at risk of fractures and can help your healthcare provider monitor your progress through treatment. Bone density tests are painless, simple and quick. With early detection, the effects of osteoporosis can be substantially slowed. When undergoing a test using the DEXA, a patient simply lies on a table in their own clothes while being scanned by a mobile arm overhead. The test usually takes 10 to 20 minutes to complete. Patients are advised to dress comfortably and not to wear attire with lots of metal buttons, buckles or zippers. Performed by a registered technologist, there are two types of mammograms. A screening mammogram is best described as a routine, annual screening exam performed on women with no specific breast complaints, while a diagnostic mammogram is performed on women with a specific complaint, such as a lump or focal point of breast tenderness. The technologist X-rays the area and reviews the films for characteristics like image quality, proper positioning and adequate compression. Films are then viewed by a radiologist who specializes in the interpretation of breast imaging studies. A report is generated and is sent to the referring physician. Magnetic resonance imaging (MRI) uses radio waves and a strong magnetic field to create clear, detailed images of internal organs and tissues. Since X-rays are not used, no radiation exposure is involved. Instead, radio waves are directed at the body. This exam takes 30-50 minutes on average and consists of several imaging series. Many studies will require a small intravenous injection of a contrast agent. However, this agent does not contain iodine, an element used in other contrast agents for X-rays or CT scans. 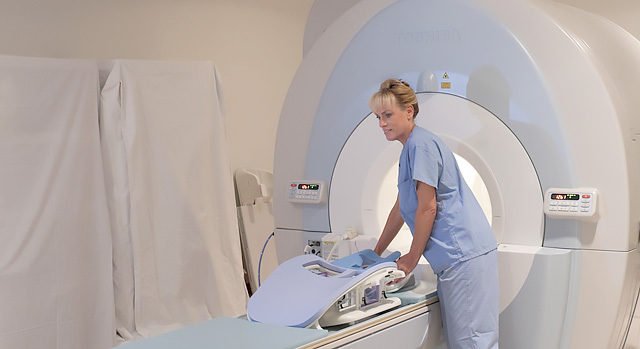 MRI is often used to evaluate or diagnose tumors and diseases of the heart, liver and bowel. As an integral part of patient care, nuclear medicine is used in the diagnosis, management, treatment and prevention of serious disease. Nuclear medicine imaging procedures are often able to identify abnormalities very early in the progression of a disease. Very small amounts of radioactive materials that are attracted to specific organs, bones or tissues are used in nuclear medicine. These materials emit gamma rays that can be detected externally by special types of cameras working in conjunction with computers to form images. 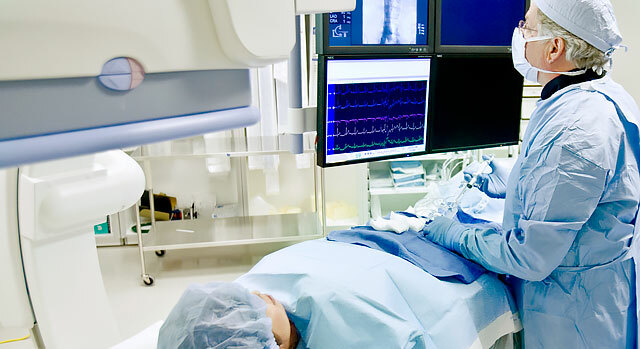 This diagnostic procedure tracks changes in a patient's cardiac output and fluid volume. These are critical indicators of how well the heart is transporting blood and oxygen to the organs. For more information or to inquire about scheduling, call 702-369-7710. The Breast Care Center provides a wide range of screening and diagnostic services.